This is a great area and is nicely bohemian and worn in. I’d say it is comfortable and ramshackle. It is without the many false airs and graces which town planners and architects often, but not always, come up with. In some ways, it reminded me of the Upper Cuba Street area in Wellington, New Zealand. There’s a whole bunch of clever people here with shops and businesses that are firmly individualistic. I always like to see that. I reckon it’s good for people. This area is certainly not bland. It lends itself to postering and there’s a lot of it – bright colours in the street. Flora for the concrete jungle. 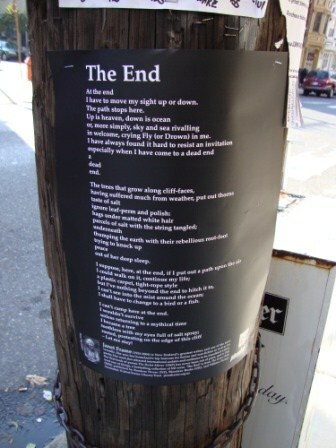 The lamp-posts are wooden and I had poetry posters by about half a dozen NZ poets. It was about 9 AM and I worked through the area with the help of a mate who enjoyed the postering as much as I did. The air was fresh and the stapler was working well. You can’t beat it. People always smile. I picked up many fliers and postcards in the little cafes. I usually send these back home to show how posters and fliers are being used in America. Newspaper advertising is falling and TV advertising is having trouble. I like to think that one of the good things that are coming out of the recession is that people are looking for something more real. This encompasses a more real form of advertising. More real forms of business. I also like to think everyone’s had enough of that ‘think big’ nonsense and all those motivational speakers (‘How to Manage Five Girlfriends and Drive a Lexus”) driving us all to an early grave. I just like postering. I saw my first flier in a cafe offering the services of a lawyer. Everyone will join in if you give them a chance. Once again a good poster run. I really enjoy taking NZ poets to America.